As an addition to the What Can I Play on Sunday? 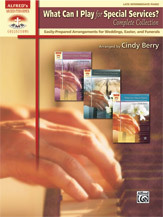 series, this collection contains the arrangements that a pianist may need when playing for a wedding, Easter, or funeral service. Approximate performance times for each piece are included to assist in planning. Titles: Air (from Water Music) * Alas! And Did My Savior Bleed? * Arioso (from Cantata No. 156) * At Calvary with Down at the Cross * Be Thou My Vision * Because He Lives * Bridal Chorus * Canon in D * Christ the Lord Is Risen Today * Face to Face * Go to Dark Gethsemane * Great Is Thy Faithfulness * His Eye Is on the Sparrow * Holy, Holy, Holy * Hosanna, Loud Hosanna * How Great Thou Art * I Know That My Redeemer Liveth * I Need Thee Every Hour with Abide with Me * I Stand Amazed in the Presence * I Will Praise Him * I Will Sing of My Redeemer * In the Garden * Just a Closer Walk with Thee * Low in the Grave He Lay * My Faith Has Found a Resting Place * Nearer My God to Thee * Panis Angelicus * Psalm 19 * Rock of Ages * Savior, Like a Shepherd Lead Us * Shall We Gather at the River with Sweet By and By * Wedding March * What a Friend We Have in Jesus * When We All Get to Heaven.